It is looming on the horizon. The Red Sox will need to make a big decision as to how the will be moving forward with their starting rotation. The starting three spots are taken by Jon Lester, John Lackey, and Jake Peavy. With just two remain for Clay Buchholz, Brandon Workman, Rubby De La Rosa, and Felix Doubront there is a major problem. It starts with the fact that Doubront, just returned from the DL on Friday, is out of options. He can't be sent back down to the Minors. Buchholz was with the Red Sox in Oakland and made his final rehab start Thursday after recovering from a hyperextended left knee. He is ready to move back into the rotation, so where does he slot in? Rubby De La Rosa could be the odd man out, although he made a strong case to stick around with seven innings of one-run ball on Saturday. De La Rosa has options remaining, as does Brandon Workman, who is eligible to return from a six-game suspension on Tuesday. Making the choice harder, manager John Farrell has expressed his desire to keep Workman in the rotation. 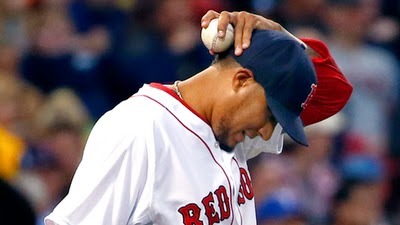 Is it time to pull the rip-cord on Doubront? He has pitched in 10 games this year, sporting a 5.19 ERA, with a little over 50 innings pitched he has walked 23, struck out 35, and given up 8 homers. Not a big chance of the Red Sox having him designated for assignment, but one can hope? If they take the usual path, we will end up with Buchholz in the fourth spot in the rotation, Doubront filling out the fifth spot, Workman in the bullpen to bridge innings behind starters, and De La Rosa heading back down to waste his efforts in Triple-A. We could hope that the choice would be made to slot in Buchholz behind Peavy in the fourth spot, put De La Rosa into the fifth spot on the rotation, and use Workman out of the bullpen. The Red Sox need to up their game. Long term they might want to start thinking about trading off Peavy and Doubront, both having been largely unimpressive so far this season. Pitching upgrades will require major moves and the question is if they are up to the task?